Following on from our recent post about how Facebook is cutting reach, there is no better time to show you some ways to improve your Facebook EdgeRank. As you’re more than likely well aware, EdgeRank is Facebook’s algorithm and determines visibility on the news feed. Optimising is a heady recipe, but after the recent changes over a month ago it seems our three golden rules are working better than others to increase reach. Facebook EdgeRank uses the type of post and the fan, to determine whether or not a post shows on a person’s newsfeed. Posts are split into six types, with status update, photo, link and video the most utilised. Research shows that photos receive the most engagement, by up to 20 times in many cases. Utilising this fact takes for some social media savvies. Posting everything with an image is a great way to leverage these stats in your favour. For instance posting a video but adding a link to the thumbnail rather than the video preview should increase engagement. This can be done by linking and then cancelling the preview. You simply then click on photo and attach the image you require. Or, why not use an image and insert a status inside the image, perhaps as a meme or via a little Photoshop magic. This can create a little edginess and is surely a lot more interesting than a text update alone. We’ve mentioned how text alone is not enough, well as with anything, there are exceptions. Women Create Life, a women’s magazine often add their full articles to posts – 800 words. This result in a ‘see more’ link at the end of the text and so these posts are seen as consumption and not ‘other consumptions’. Though, it is not certified that this feeds into EdgeRank, these long posts tend to be shared more almost certainly fueling the algorithm. Posting to a demographic is a tried and tested way to increases engagement and for obvious reasons. Using your market research to post to those who have a definite interest in your brand, topic or post is a sure fire way to higher engagement. Facebook segments through everything from education, location, to age and gender. Of course, the more you segment who the post is sent to the fewer people overall it will reach. However, the likelihood of high engagement is far greater, with the person directly and also if the person shares to others in their demographic. This may even result in the algorithm showing the page to other people, which will increase the likelihood of them Liking, following, sharing and doing EdgeRank positive things. By working our three golden rules into your social media strategy, you can take advantage of the EdgeRank changes and in doing so increase engagement and reach. Do, you find anything has changed in the recent months with your Facebook reach? A lot of brands are reporting obvious engagement declines, but some of our personal clients are unaffected. Let us know via the comments how your page has fared. 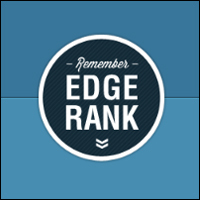 Cant get your head around Edgerank and social media optimisation? Hire us for our social media service!